It has always been my aim to involve the monkies in any form of volunterrism since young, because I have always believed in giving back to the society, in whatever way we can contribute. So ever since when the boys were in kindergarten, we had helped out in elderly homes, packed CNY goodie bags and delivered them to needy families... all of which I hoped had made a small difference. So last Sunday, we had the opportunity to volunteer again as a family at the Young NTUC-North East CDC Project Refresh, a day where volunteers from all walks of life come together to help less privileged residents spruce up their homes. 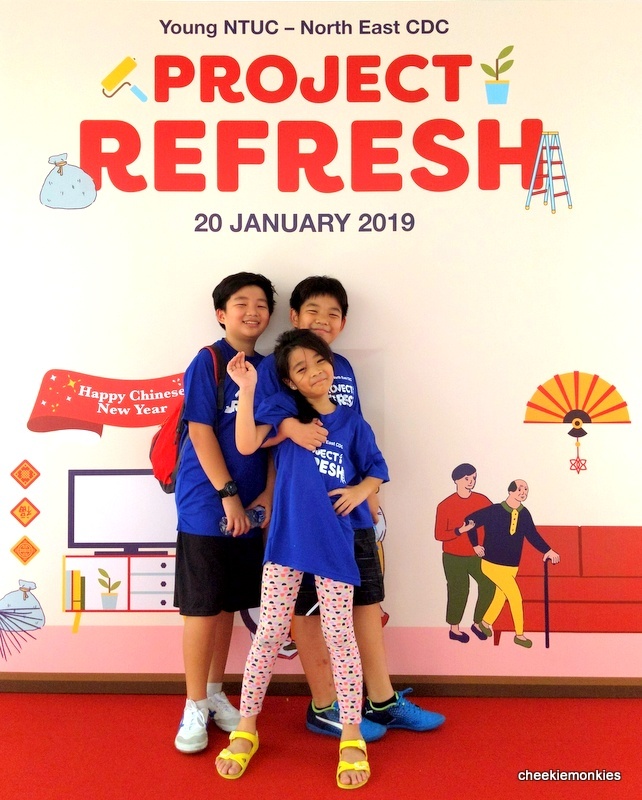 While this is the 12th edition of Project Refresh nationwide, it is also the sixth time that Young NTUC (YNTUC) and North East Community Development Council (CDC) collectively organised such an event - and this is the largest in terms of scale yet! 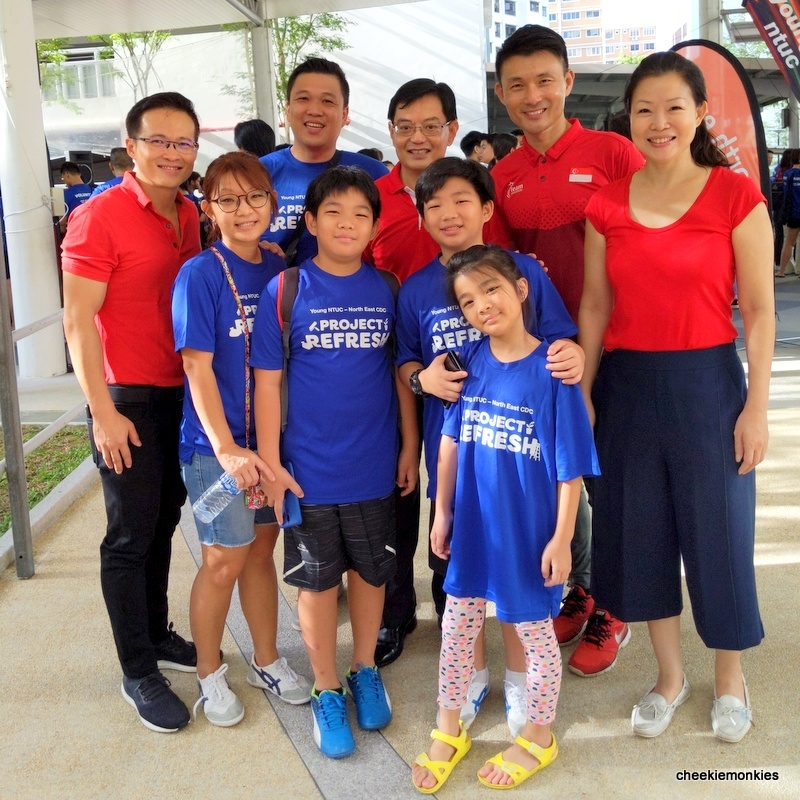 A total of 1,000 volunteers from unions, schools, corporate organisations, grassroots and Tampines residents came together to refresh the homes of low-income seniors living in the Tampines GRC. The objective was to improve these elderlies’ living environment so they can reside in safe, comfortable homes. Project Refresh was mooted by YNTUC in 2016 to inspire volunteerism via an accessible platform. Since 2017, YNTUC has joined hands with North East CDC to run five Project Refresh in the North East District, making the latest edition the sixth and judging from the tremendous response, it has certainly grown from strength to strength. A total of 96 household units in Tampines were selected to receive refurbishments works and these included cleaning, decluttering, painting and furniture replacement. We, together with other volunteers, were separated into groups and assigned to different units. We were assigned to a unit which belonged to an 85-year-old man who lived alone. Our job scope was relatively straightforward which was helping to spring clean his home. And the monkies promptly got down to work. The work was nothing too taxing - most of it involved wiping away dust that had accumulated on furniture, window sills, doors and grilles. It also marked the first time that the monkies tried their hand at dismantling an electric fan and cleaning the fan blades and grilles. I think they can clean the fans at our home next. LOL. The cleaning squad in the home wasn't just us. It also comprised of other youths who had also given up their Sundays to aid in the good cause. One of the dirtiest place sin a home is usually the toilet and/or the kitchen, with plenty of grime stuck to its walls. Took more than a bit of effort to scrub it clean, but the feeling of satisfaction was immense. Besides cleaning works, some of the households were also in need of a fresh coat of paint. So while Ash and I were busy scrubbing off grime from walls, both Ayd and Ale had a chance to help out in painting the walls of an elderly couple's home. Through Project Refresh, the monkies had the opportunity to learn more about different perspectives from different groups of people from different walks of life. Personally, I am not sure how much difference we made to the lives of the elderly folks that we met, but I am thankful we were able to bring some cheer to them. In fact, for the elderly man whose home we helped to clean, he was overjoyed with the company he had for the day. So even though the efforts from the volunteers may last a day, the positive impact on the beneficiaries goes well beyond that. But for us and the monkies especially, it was a truly sobering experience to see the other side of Singapore that we hardly come into contact with. Most, if not all, of the elders are living alone and it really made me feel truly grateful for all I had. Family, friends, nice meals, a cosy bed and above all, a warm home. These are things the monkies often take for granted, that they do not realize they have been blessed with. So while we had the intention of setting out to spread some CNY festive cheer through Project Refresh, it turns out that we were the ones who would be blessed instead. To find out about upcoming Project Refresh sessions and to volunteer, call North East CDC at 6424 4000.